The Green Mile Straitjacket Green Mile Straitjacket Did you ever see the Green Mile, a great movie staring Tom Hanks and Michael Clarke Duncan? Now what was the best scene in the movie? One of John Coffey's miracles? Old sparkie in action? No! Of course not. The best scene was Sam Rockwell's (Wild Bill's) straitjacket encounter. Will Bill pissed off the Green Mile guards (literally) once too often and got a special room for the night, with a special jacket to sleep in. Wild Bill seemed to enjoy it, because he soon put on a repeat performance. 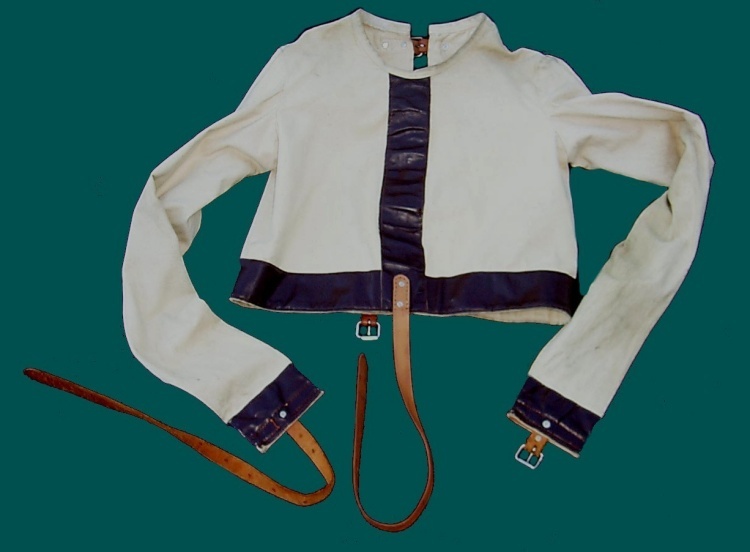 Shown above is the actual jacket worn by Sam Rockwell in the Green Mile movie. It was purchased from the California magician who rented it to the Castle Rock Entertainment prop department for the movie. Sorry to disappoint you all, but the jacket is gaffed Abbott jacket originally made in the early 1980s. But it is a quality item that looks great and Wild Bill was too crazy to figure out how to operate the gaff. The Green Mile Web Site Tom Hanks with the jacket. Percy borrows Wild Bill's jacket for the evening.